Some background on the politics of airports in Sydney – the airport debate was shaped dramatically in 1995 following the opening of a third runway in Sydney’s Kingsford-Smith airport. While this upgrade deferred the need for a second airport for some time, it also angered many locals due to the increase in aircraft noise that it brought with it, resulting in the formation of the No Aircraft Noise Party. This party received 39% of the vote in Marrickville and 36% in Port Jackson on a 2 party preferred basis (Source: Psephos), both heavily affected by increased aircraft noise. In 2003, the Labor Party changed its platform to oppose a second airport at Badgerys Creek (the irony being that it had been Hawke Labor Government that obtained the land in the first place in 1986), and the Coalition followed soon after. In the 2012, the debate over a Second Sydney Airport seemed to be whether or not to build one. Those against an airport included the NSW Premier, Barry O’Farrell, and the federal National Party leader, Warren Truss, who was also the Shadow Transport Minister. Local MPs and councils in the Western Sydney area (of both parties, but mostly from the area’s dominant Labor Party), where a second airport would be built, also seemed almost universally opposed to a second airport. Meanwhile, the Federal Transport Minister, Anthony Albanese, and Federal Shadow Treasurer, Joe Hockey, both supported a second airport,but appeared to rule out Badgerys Creek, leaving Wilton as the remaining preferred option. It began with the release of a report last year entitled the Joint Study on Aviation Capacity for the Sydney Region. 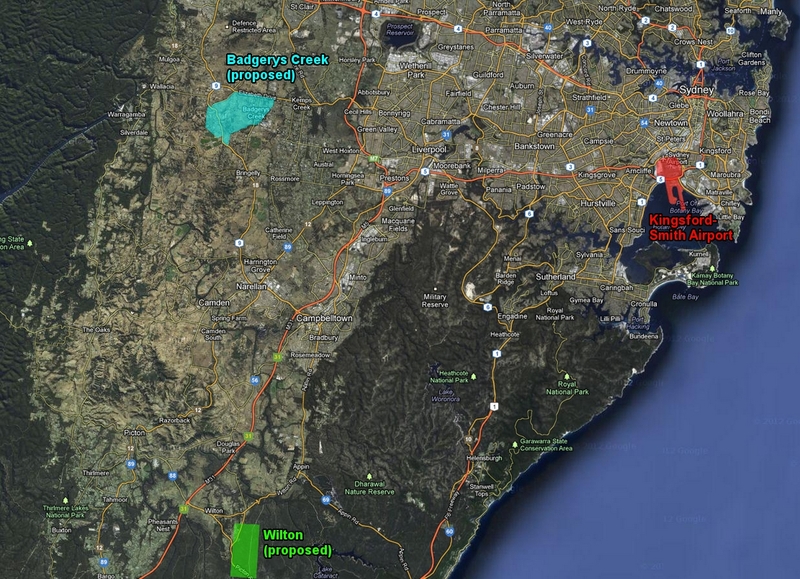 The knee jerk response was measured at best, with politicians continuing to state their opposition to Badgerys Creek, despite the joint study finding that it was still the best location. Anthony Albanese, restricted by Labor Party policy, announced a second study into Wilton, the second best site identified by the joint study. Jake Saulwick’s opinion piece in the Herald suggests that Mr Albanese actually prefers Badgerys Creek, and the Wilton study is designed to demonstrate that Wilton is not suitable (primarily because it is too far from either Western Sydney or Sydney CBD, not very flat, and prone to fog). At this point, a push can be made to change the Labor Party’s platform to remove the ban on Badgerys Creek. Meanwhile, commentators began to point out that an airport in Western Sydney would bring jobs and economic development, not just aircraft noise, and this is something that Western Sydney desperately needs in order to stem the daily mass migration from Western Sydney into the CBD because the region has fewer jobs than it has workers. This appears to have been the turning point in the debate, and by the start of 2013 politicians who had previously ruled out Badgerys Creek, and even ones who ruled out a second airport entirely, were now calling for Badgerys Creek to be put on the table as an option. Some even openly began calling for Badgerys Creek to be the site of a second airport. The case for a second airport was also boosted when it was announced that the decision to host the 2014 G20 meeting in Brisbane rather than Sydney was driven partly by a lack of the required space in which to park 40 jumbo jets for the duration of the summit. The take home lesson from this was clear – Sydney Airport isn’t just close to reaching capacity, by some measures it already has reached capacity. What appears to have happened is that politicians have privately come to the realisation that Sydney needs to start planning for a second airport, and that this second airport will need to happen in Badgerys Creek. Additionally, this is something that is going to affect whichever party is in government at the time, so opposing it for political gain will only come back to hurt that party in the future once they are in opposition. While it remains an unpopular position, there has been a clear movement towards supporting Badgerys Creek in the last 12 months. The recent views of key individuals in this debate are included below. Few actually flat out oppose a second airport in the Sydney basin. 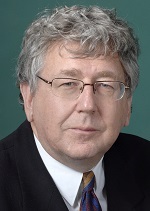 Those that do tend to have self interest in mind (Sydney Airport Chairman Max Moore-Wilton) or know that as it is an issue for the federal government they can champion a popular position without having to make that decision themselves (Barry O’Farrell). Most of the opposition now comes not towards a second airport, but to Badgerys Creek specifically as a location. The potential for local opposition has only grown in recent decades as the population of Western Sydney has continued to grow. The case for Badgerys Creek is not helped by the presence of 2 members of Federal Cabinet (Chris Bowen and David Bradbury) being MPs from Western Sydney, nor from the state opposition leader (John Robertson) also being an MP from Western Sydney. In Mr Bowen’s case, he has remained tight lipped on Badgerys Creek ever since the 2007 election put his Labor Party into government, and you have to go back to 2007 to get an on the record comment from him on the matter. This category involves reading between the lines at times. In Anthony Albanese’s case, in particular, he is on the record as opposing Badgerys Creek, supporting Wilton instead. But his actions, or rather lack thereof, suggest that he actually prefers Badgerys Creek. It therefore seems most logical to place him into this category. In Warren Truss’ case, he had previously ruled out a second airport entirely, whereas he now appears to have backtracked to just ruling out Badgery Creek in the context of the next election, suggesting that he also is reconsidering his position. “I know the problems with all of the sites, but I know why Badgerys Creek was chosen in the first place, and I thought it was very interesting the [recent state and federal inquiry] basically put it right back on the table. But both sides of politics have ruled it out, so that is where it is at the moment. We’ve ruled it out, and we will rule it out in the context of the next election as well, and Labor has ruled it out as well. Up until Nathan Rees came out in support of Badgerys Creek, it was virtually impossible to find any current Western Sydney MPs willing to state their support of Badgerys Creek on the record. Former politicians, those who stand to directly benefit, and independent experts have tended to be the only ones championing the site. A recent piece on Channel Seven’s Today Tonight program discusses transport usage across a number of Australian cities over the last 35 years, and finds that Sydneysiders have the highest public transport use of any Australian city. 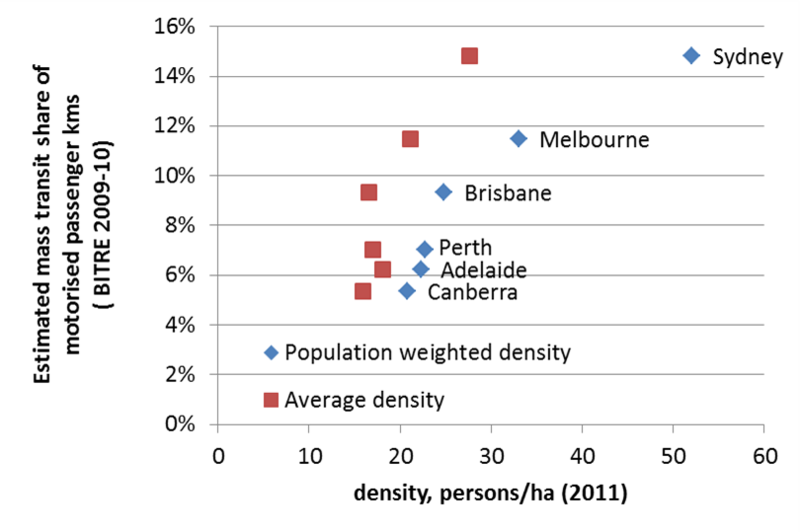 (This isn’t really new information, given that transport is one of the questions asked in each 5 year census.) The video of the story is included at the end of this post. The report correctly points out that this fact would probably surprise many Sydney commuters, as would the assertion made by Dr Lucy Groenhart, an RMIT academic and author of the report, that Sydney is “built around a strong heavy rail network” and has buses which “are better co-ordinated than in other cities”. Dr Groenhart appears to be comparing Sydney to Melbourne, where one major flaw in the network design was separate train and tram networks that competed rather than complemented each other (so it’s quite common to see a train and tram line running in parallel). Conversely, in Sydney the network has been designed around the rail network, with feeder buses that link commuters from their home to the nearest station or transport them between stations on different lines. This expands the catchment of the transport network considerably. Countering this view is Kerryn Wilmot, Research Principal for the Institute for Sustainable Futures at UTS, who points out that Sydney lacks integrated fares. 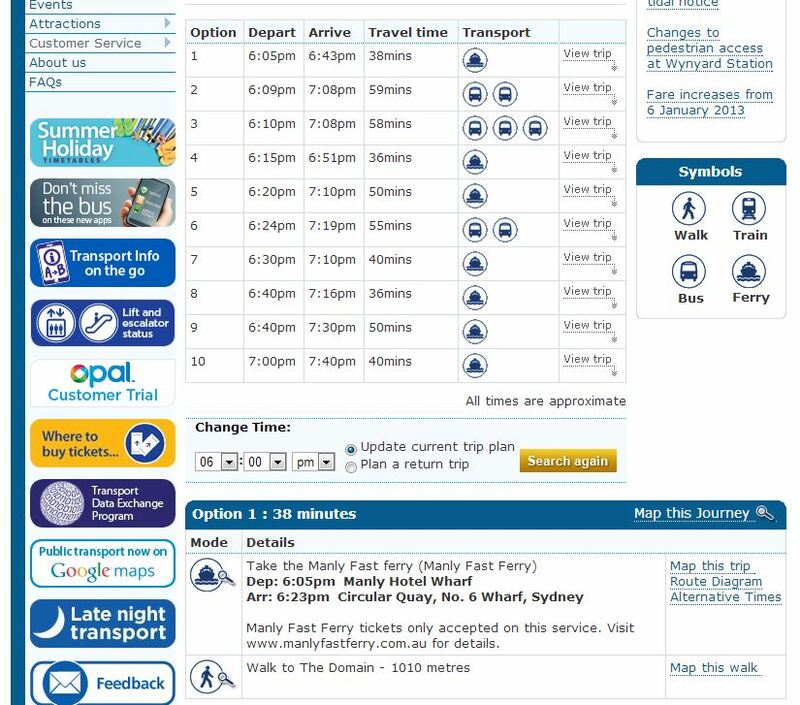 It’s true that while Sydney has an integrated network, it lacks an integrated fares system. That means that users are penalised if they make a transfer (unless it is train to train), which prevents an integrated network from working most efficiently. Having a myMulti ticket does get around this problem, but these are currently only available as periodicals (there is a daily ticket, though very expensive at $21) and are city-centric, meaning that if you only intend to travel within one of the outer zones then you must also pay for the inner zones even if you aren’t heading into the CBD or inner city. However, Ms Wilmot’s claim that “you can’t get a yearly that just allows you to become a public transport user to do all of the stuff you want to do during the week” would appear to be incorrect, as you can get a yearly myMulti ticket which would allow you to do that (unless you just wanted one for one of the outer zones only, which as mentioned earlier is not currently allowed). Towards the end of the piece it makes the point that taking the toll roads from Northwest Sydney only saves one minute of travel time, yet costs $12 in tolls. What it does not point out is that most of this trip is along the M2, which is being widened and where the associated road works have virtually eliminated the travel time savings until the construction has finished (which just so happens to be some time early this year). This is just sloppy journalism, but while that’s normally the norm for Today Tonight, this time it appears to be the exception. That, and the bit where the reporter is walking on the bike path, which is just as illegal as bikes on footpaths not designated as shared paths. Dr Groenhart concludes that “the government’s priorities are not with sustainable transport so they are with roads”. She doesn’t state which government she is referring to, and given that Today Tonight did a Sydney and Melbourne version of this story, it is possible that she was referring to the Victorian government. This would make sense, given the Victorian government has made a road tunnel under the CBD it’s top priority, with a smaller CBD rail tunnel being the next most important transport project. Compare that to NSW, where the top project is the Northwest Rail Link (a public transport project), and the next most important projects are WestConnex (a road) and a Second Harbour Crossing (another public transport project). 3 years behind schedule and $700m over budget, the Southern Sydney Freight Line was opened yesterday. This new line will separate freight trains from passenger trains between Sefton and Macarthur, which until now had required an 8 hour curfew between the morning and afternoon peak hours that prevented freight trains from using that section of the line. Sydney previously had an exclusive freight rail line only between Port Botany through to Sefton (red in the diagram below), with freight trains having to share track with passenger trains on the Western, Northern, South, and Illawarra Lines. There was also a freight line that connected Dulwich Hill to Darling Harbour, but the conversion of Sydney Harbour from a working port to a cultural centre has allowed that line to be used for light rail. The South Sydney Freight Line (blue in the diagram above) will now allow trains to continue South unimpeded by passenger trains. 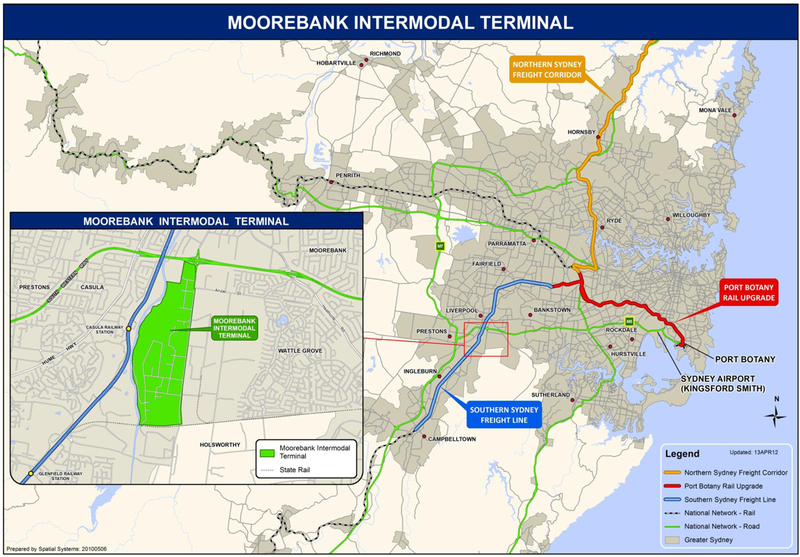 It will later be supplemented by the Northern Sydney Freight Line (orange in the diagram above), which will allow freight trains to cross the entirety of metropolitan Sydney without disrupting passenger services, helping to take more trucks off the road. 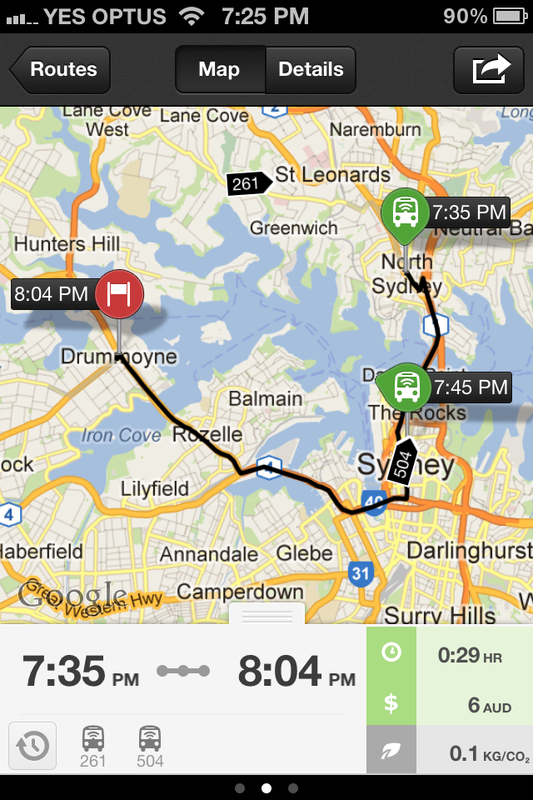 One of the first posts I made on this blog in mid 2011 was about real time location services for public transport. At the time, this was limited to an SMS service where you send a message with a bus stop number and receive a response with all buses set to arrive there in the next half hour, achieved by installing GPS devices on buses to track where they are at any given time. There was also the 131500.info trip planner, but it did not provide real time data nor was it the most user friendly system out there. Mobile apps like TripView did provide a better user interface, but did not provide multi modal functionality (so if you had to catch a bus and train then you needed to do 2 separate searches). 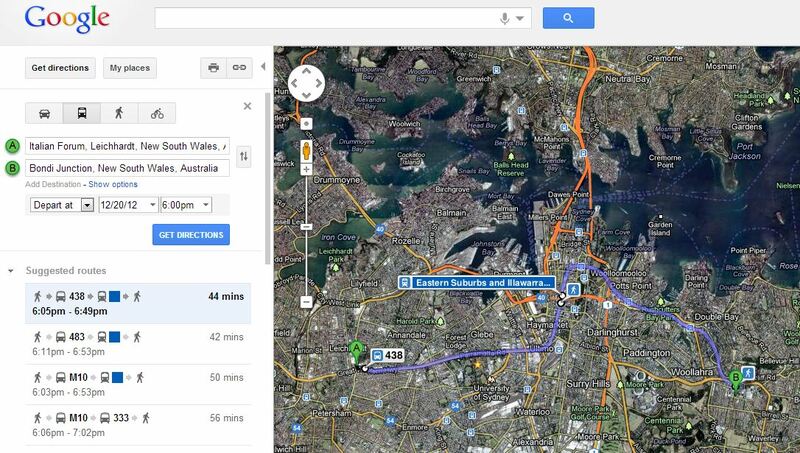 Meanwhile, the easy to use Google Transit function on Google Maps was limited to trams and the monorail in Sydney. At the time, I lamented that there was not some more user friendly, perhaps more graphical form of providing this service, and one that provided the actual real time location of your bus/train/ferry/tram rather than just what’s on the timetable. There was little reason why either wasn’t possible at the time, in fact the former had already been achieved by Fink Labs before being shut down by the Transport Department (see image below). Thing have changed significantly since then. Google Transit expanded to all modes of transport, while real time data (currently only for for government buses, but hopefully set to be expanded to all buses next year) was introduced to transport apps. So here is a summary of some of the major transport services: 131500, Google Transit, TripView, and TripGo. Note: One of the mobile apps (Arrivo Sydney) that recently added real time information is Android only, and as an iPhone user I was unable to try it out. This is the official government transport information service. It was great when it first came out years ago, but has seen little improvement since. In almost every case, you’re better off going with Google Transit. Google’s service is easier to use, has a better display, and everything that Google is missing is also missing from 131500. The one exception is the phone service for those luddites out there, where someone at the call center will let you know the details you need. Strangely enough, despite this being the government service, it lacks real time data for buses. All bus, train, ferry, and light rail timetable data in was incorporated in July of 2012. It provides multi-modal information, so you do not have to do a separate search for a bus trip and a train trip, you just did a single search that gave you the information for both. The user interface is very easy to use, both on a computer or a mobile device, particularly for people who only know the origin and destination, but aren’t sure where nearby bus stops or train stations are or what the best bus route to take is. The main downside is the lack of real time data, and thus does not take into account delays to services (similar to its traffic function, which recommended the fastest way to drive given the road traffic at any particular time and day). Prior to Google Transit, this was arguably the best mobile transport app. A free version is available, with a premium version which allows you to save trips for easy access later on. It now contains real time bus data, and this is displayed in an easy to read format. It is also the only app I’ve seen that allows offline use by downloading all the timetables to your device (handy when you’re in a black spot or out of data). The new TripView app shows the actual time above and the original timetabled time below, next to a square coloured to indicate whether it is early (blue), on time (green), or late (red). The real time data can also be displayed in map format, in a similar manner to the Fink Labs app from 2011, but with one important improvement – it now tells you the direction the bus is going. TripView also includes a map showing the actual location of all the buses that will go from the origin to the destination of your designated trip, indicated by the green line. A triangle indicates which direction the bus is moving in. The main shortfalls of TripView are that it does not allow multi-modal trips, and you need to know the exact origin and destination of your journey. For example, if you are going from the city to Castle Hill, it won’t tell you whether the best way to get there is to get a direct bus, or to take a train to Parramatta and then change for a bus. You have to work that out yourself. And if a train and bus is the faster option, then you have to do 2 separate searches. Also problematic is that if you tell it that you are going from a specific bus stop, then it won’t consider telling you to walk around the corner to catch a bus from another bus stop, even if that is a quicker option. But if you are familiar with the bus and train network, then that’s less of a problem. At first, TripGo looks like the poor sibling of TripView. In actuality, it’s something inbetween Google Transit and TripView. Like Google Transit, it provides multi-modal trips (including driving and bicycles), and like TripView it provides real time bus data. In addition, it also has taxis as an option, and allows you to sort the alternatives by cost in dollars, trip length, carbon emissions or first to arrive at destination if you leave now. This also means you don’t need to have an understanding of the transport network. It also makes use of your address book and calendar when setting up your trip. This app is new, and has some teething problems. For example, it sometimes complains that the origin and destination are too far away, doesn’t factor in the airport station access fee in the cost of getting the train to the airport, or recommends driving to and parking at central station before getting a train from there. Where it misses the mark is on the user interface, which just feels a bit clumsy. That in itself is enough to keep me from using it on most occassions. Though if I’m making a trip to or from an unfamiliar location for the first time, I’d consider using it just that once to gather my bearing. But after that I’d probably stick to either Google Transit or TripView.